A graduate of the Seattle Public Schools, Ethan is proud to be a part of the revitalization of the music program at West Seattle High School. Ethan holds a Bachelors of Music in Saxophone performance and composition from Cornish College of the Arts and a Masters Degree in Education from Seattle Pacific University. After working for several years as a freelance professional musician and volunteering at several local schools, he decided to pursue a career in music education. Ethan began his career as a teacher for six years at University Preparatory Academy in North Seattle before moving to West Seattle High School in 2012. He lives in West Seattle with his wife and two daughters. 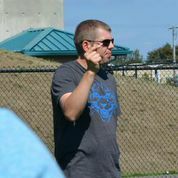 Taylor Fritts began working in Seattle Public Schools in 2014 as a Band/Orchestra substitute. In the fall of 2016, he began working as the orchestra teacher at Madison MS and WSHS. Raised in Long Island, New York; he has a Bachelor's degree in music education from the University of Delaware. Taylor's primary instrument is viola, and enjoys playing violin as well. He is happy working towards improving students' ability to create, shape, and understand varieties of music.